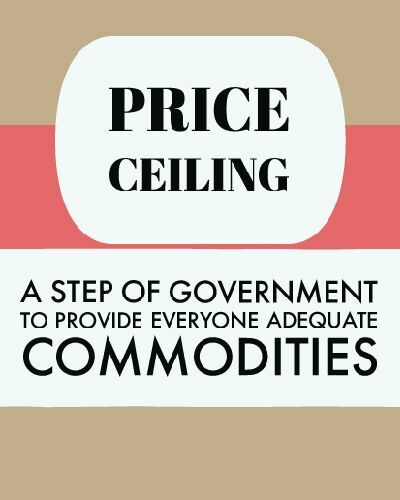 Price Ceiling and Price Floor are two methods of Government intervention to achieve specific objectives. We know that prices of goods and services are determined by the forces of demand and supply in the market. Price Ceiling means maximum price that a seller can charge from buyers. No seller is allowed to charge price more than maximum limit. Price Ceiling is fixed by government of a country. When necessities of life are scarce, prices are often very high. Rich section of society faces no problem to afford these but poorer section struggles to afford. Therefore it becomes necessary to fix a price which should be lower than current price prevailing in the market. If this is not done by government, many problems will take place E.g starvation of death, malnutrition etc. As we know that price Ceiling is fixed at a price lower than market price so according to law of demand demand will be extended. According to law of supply , when price of any commodity decreases, supply will decrease. It happens also here. Due to decrease in price supply reduces. Due to operation of both laws a situation of excess demand arises. The quantity that people wish to buy of the commodity would not be available to them. This partial non availability of commodity will force people to remain hungry partially. Government now starts rationing to tackle this problem. Each person is given fixed quantity of the commodity at ceiling price. Rationing is a system which is called Public Distribution System by which necessities are distributed to poorer section of society. Is rationing proved efficient in a country like India? Answer is NO. Because black marketing practices and standing in long queue for hours is a main drawback of PDS in Country like India. Government should strictly monitor this system so that black marketing practices can be stopped. You may have heard a term “ MSP”. MSP means minimum support price. 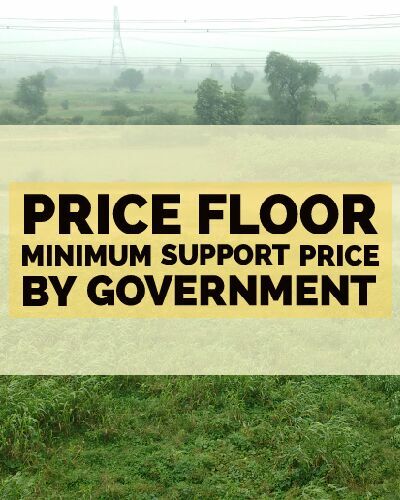 Price Floor means minimum price that a trader or shopkeeper or government shall pay to the farmer against their production. Farm products are seasonal. These are harvested and sold in a very short time period. During this time there is excess supply in the market. Due to excess supply price remains low. This disappoints farmers and force them to cut their production. If it happens there may be shortage of food nationwide. 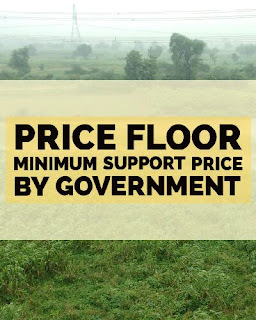 Reason behind Minimum Support Price is that notwithstanding good production of crops, farmers do not get efficient price for their crops in market therefore government introduced MSP and applies price Floor. It is a commitment of government to the farmer to provide adequate return. In the Price Floor Price fixed by government is above than market price which the traders must pay in wholesale market. But the traders are not legally bound to purchase farm products at floor price. Now the government buys the entire farm products of the farmers at Minimum support Price. It creates buffer stock with government which is used for public distribution. Thanks for visiting us. Please comment us your views and subscribe us. Thanks. This is our aim to serve readers.